Melanoma and skin cancers detected early are curable. Your skin cancer check-up generally involves two visits to Molescreen. After these two visits you will have a good understanding of what you need to do or not do. On the first visit, you will have a skin cancer consultation and full body skin examination with a doctor. A nurse will photograph any atypical (unusual) spots. After this you may need to return to have abnormal spots removed and/or to have follow-up photographs to check for changes. Your first consultation at Molescreen normally takes about 45 minutes. A doctor will talk to you about your skin cancer risk factors and relevant issues in your medical history such as illnesses and operations, medications and allergies. We request that you complete and send us the Patient Registration Form before your first visit to assist this discussion. Please see our page about preparing for your skin cancer check-up so that you will know what information you will need to bring. After discussing your history, the doctor will examine your skin. Many skin cancers are undetected or unnoticed by the patient, and a full body check-up sometimes reveals problems that the patient did not know about. This is why we recommend a full body examination for almost all patients. For a full skin examination, you will need to undress to your underwear. We will provide an examination gown for you to wear, or a blanket to wrap around yourself if you wish. The doctor will carefully inspect your body all over, looking for abnormal skin lesions or moles with unusual colours or shapes. We do not routinely examine the genital area unless you ask us to do so. Skin cancers are extremely rare in this area, but we are happy to examine any spots that concern you. We will routinely examine your scalp if you are bald. If you have a full head of hair, skin cancer of the scalp is very unlikely, so we would normally not perform a thorough scalp examination unless specifically requested. Bear in mind that if you are not bald, we cannot guarantee to find every skin lesion on your scalp. If you prefer not to have a full body examination, the doctor can examine only those spots or lesions you are concerned about. The doctor will closely examine any unusual spots with a dermoscope. This is an instrument that magnifies and lights up the skin, allowing the doctor to see through the top layer of the skin. With a dermoscope, a doctor can tell if a mole or spot is normal or abnormal. Dermoscopy has been proven to significantly increase the rate of skin cancer detection. Take high-magnification photographs of spots. Take photographs of your whole body, or regions of your body. If these photographs are repeated, our computer can automatically determine on your next visit if you have developed new spots or if there are significant changes in the spots that were already present. This procedure is most useful for people with many moles. Your doctor will offer it if he or she thinks it would be useful, but in most cases a thorough full body examination with the dermoscope is sufficient. If you would like total body photography and your doctor hasn’t mentioned it, please feel free to ask about it. Your doctor will show you the photographs and point out any suspicious features. This will help you and the doctor decide if any of the spots must be treated soon, or if they should be observed for changes over a period of time. 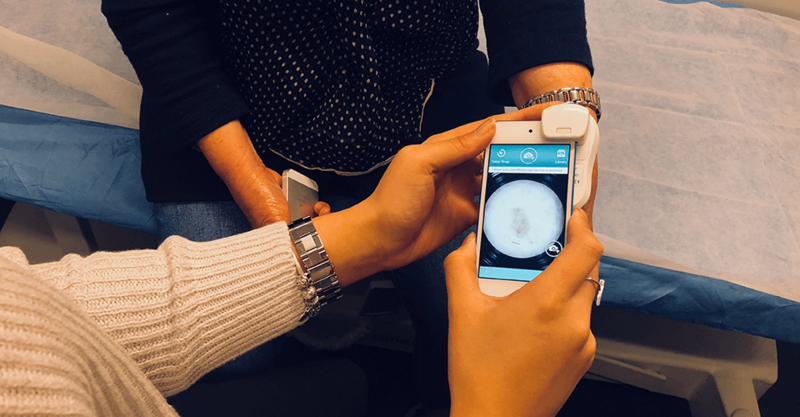 Over the coming months, we aim to introduce technology which allows you to see any spots of concern while the doctor is examining your skin. Your doctor may choose to photograph these spots at the time of examination, or a nurse may photograph them later. You would normally need to return at a later date for more complicated and time-consuming procedures (for example, requiring stitches). If you have mildly atypical non-standard) spots, we will ask you to return (usually in three months) so that we can re-examine and re-photograph them. If they don’t change significantly, it’s unlikely that they are skin cancer. If any spots look significantly abnormal, we will make arrangements to either diagnose or remove the lesion. We can easily remove or biopsy most lesions in our treatment room, or we can arrange referral to a specialist surgeon if you prefer. Based on your risk factors, skin type and any abnormal lesions we discover, we will make recommendations about when you should return in future for regular full body skin check-ups.